Located on 500 lush acres, this luxury hotel provides a quiet retreat, yet is a well located to Orlando's most exciting attractions. Each of the elegant rooms and suites is a haven of relaxation, offering luxury bedding, marble bathroom, 24-hour room service and Internet-ready TV. Enjoy an innovative menu of farm-to-table fare at Whisper Creek Farm: The Kitchen; pamper yourself with a treatment at the spa or float along the lazy river pool as you soak up the Florida sun. 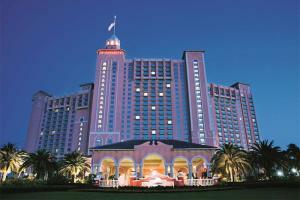 The hotel offers shuttle service to Walt Disney World®, SeaWorld® and Universal Orlando®.